Take 384 acres of fertile, rolling high-desert country in the rainshadow of the Cascade Mountains, where blossoming orchards and vineyards rise above 120 km Lake Okanagan. Blend in the rich green artistry of golf course architects Les Furber and Nicklaus Designs. It all adds up to The Okanagan Golf Club, one of British Columbia's most intoxicating golf destinations. The Okanagan Golf Club presents its first challenge before you even pull on your spikes: which of our two championship courses - The Quail or The Bear - to play first. Afterward, kick back in our welcoming clubhouse to revisit your best shots over a refreshing drink. Or try to improve upon them at our extensive practice facility. 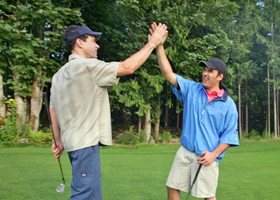 If you need help, the GBC Golf Academy at The Okanagan Golf Club is located on site. Out-of-bounds -defined by boundary fences, white stakes or white lines. Penalty, Stroke and Distance, Rule 18. Alternative to Stroke and Distance. “When a player’s ball has not been found or is known or virtually certain to be out of bounds, the player may proceed under Model Local Rule E-5, for a penalty of two strokes, rather than proceeding under stroke and distance." Bear Course: #3, #5, #6, #7, #9, #10, #11, #12, #13, #14, and #16. Red Stakes - red penalty areas. Yellow Stakes - yellow penalty areas. Free drop from all constructed pathways. Yardage markers from centre of fairway to the middle of the green. Red - 100 yards, White - 150 yards, Blue - 200 yards. Yardages on sprinkler heads are measured to the center of the green. Non-potable water used in washrooms and to irrigate golf course. Please replace divots, repair ball marks on greens and rake sand traps. Pull carts and power carts are not permitted on tees or beyond lines marked in front of greens. All traffic in and around greens should follow cart paths or other designated routes. Proper golf attire should be worn at all times. Please try to keep up to the group ahead of you. Slower players must allow faster players to play through.